It is finally here! 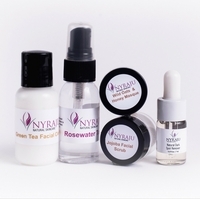 A Face Firming Serum for Women of Color. You asked us to recreate the ever-popular Women of Color Ultimate Serum - without the propylene glycol. We proudly give you our Black Skin Care Supreme Facial Serum. Hyaluronic Acid infuses moisture into your face, giving it a vibrant glow that takes years off - in an instant! And if that was not enough, we decided to pack in even MORE age-fighters like DMAE, Vitamins A, B, C, and E, CoQ10, alpha lipoic acid, and meadowfoam oil - not just to fight the effects of aging, but to turn back time itself! Our Black Skin Care Supreme Facial Serum is specially formulated to be a one-step solution to prevent the signs of aging from showing on your face. You can apply it in the morning prior to makeup application, and at night before moisturizing. It is gentle enough to use on the neck, face, lips and around the eyes. So line up, all women of color - go ahead and give it a try - we know that you will love it as much as we do! One squirt into the palm of your hand and with your finger tip, apply this product around the outer corner of your eyes, under your eyes and on top of your lip and outer corners of your mouth. (Night only) Some clients have found this product to work as a moisturizer for them. Rose Distillate, Organic Aloe Vera Juice, Vegetable Glycerin, DMAE, Emulsifying Wax, Meadowfoam Seed Oil, Organic Bilberry Extract, Organic Sugar Cane Extract, Organic Sugar Maple Extract, Organic Orange Fruit Extract, Organic Lemon Extract, Organic Cranberry Extract, Vitamin E, Sodium Hyaluronic Acid, Vitamin C, CoQ10, Beta Carotene (Pro Vitamin A), Vitamin A, Alpha Lipoic Acid Acid), Pro-Vitamin B5, Vitamin B3, Carrot Oil, Lecithin, (May contain sodium bicarbonate and/or citric acid as pH adjusters). I noticed dryness at the corner of my eyes and actually saw wrinkles forming. This was not suppose to happen after all I'm a black woman. We don't get crows feet! Wrong answer .. I got them and had to find a product that was natural and safe for my eye area. The Face Firming Serum helped soften the pronounced lines forming around my eyes and now have them looking soft and moisturized.